Sign up to become a member of our mailing list and you’ll receive a ‘Weekly Digest’ email containing all our best pictures, videos and stories from that week. Only by being on our mailing list will also be eligible for regular giveaways and competitions. We also send out discount codes and cat product recall information as and when we receive them. Enter your email address into the form below and click ‘Sign Up’ to join. Thanks for all your support and we hope you enjoy our site. Want To stop Your Cat Urinating in the House? 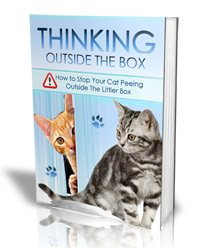 We Love Cats and Kittens is sponsored by cat behaviour expert, Mike Whyte, whose proprietary method to stop your cat urinating outside their litter box is available only in his acclaimed ebook . Mike’s method is 100% guaranteed to work for your cat. If for any reason his method does not wok he offers a full money refund guarantee. If you are suffering this problem with your cat, please try out Mike’s course.